As Christmas approaches, many young volunteers will be getting together to make thousands of bowls of delicious, hearty soup. On Sunday 17 December the volunteers will take them to needy households and will share with others the warmth of neighbourliness. This is the 6th anniversary of our annual soup sharing and the event keeps on growing. 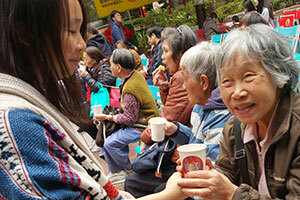 This year we are expecting about 4,500 people to join us in Yuen Long District and volunteers will visit about 300 homes. It’s all in celebration of bringing people together and building a strong sense of community.